Savile Row was built over the kitchen garden of Burlington House, now home to The Royal Academy, in 1695. 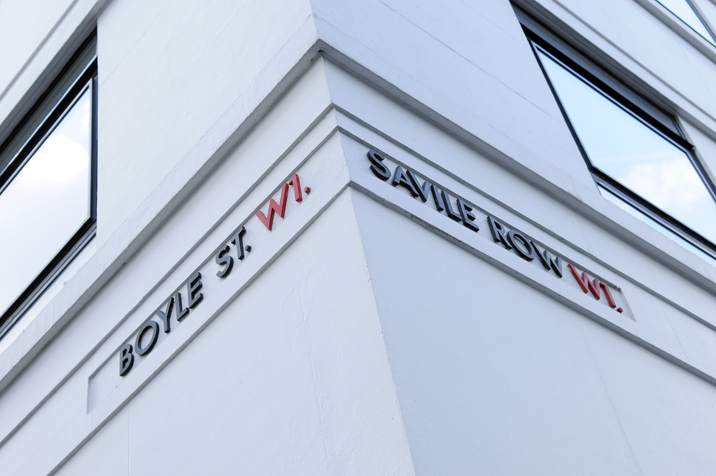 It is named after Lady Dorothy Savile, who married Richard Boyle, 3rd Earl of Burlington in 1720, the union mirrored in the joining of Boyle Street and Savile Row. The first tailors set up shop here in the late 18th Century, and secured their reputations after acquiring the patronage of both The Prince Regent and the premier dandy of the Regency age, Beau Brummel. The Prince Regent’s tailors, Hawkes, later merged with Mr. Gieves to form Gieves and Hawkes, which is still in business at No. 1. Their other customers have included Captain William Bligh (of The Bounty) David Livingstone and Henry Morton Stanley (who required sun helmets for their African excursions), and Charles Laughton, for whom they provided replicas of Capt. Bligh’s uniform for the great actor’s portrayal of their erstwhile client in Mutiny on the Bounty (1935). Also during the 1930s, no. 8 was home to the firm of Kilgour, French and Stanbury, who made Fred Astaire’s morning coat for the film Top Hat, initiating a tradition of Hollywood stars coming to Savile Row to get rigged out. The Royal connection continues at No.30, where Anderson and Sheppard make suits for Charles, Prince of Wales. Richard Brinsley Sheridan, author of The School for Scandal, died at no. 14 Savile Row in 1816. He had appealed to his old friend The Prince Regent for financial help to mitigate against his decline, but none was forthcoming. Sheridan’s corpse was smuggled out of the building for fear his creditors would seize it and hold it to ransom. Jules Verne gave no. 14 as the address of his character Phileas Fogg in Around the World in 80 Days; and since 1946, it has been premises for Hardy Amies. Henry Poole – credited with the invention of the Tuxedo, in 1860, and once the largest tailors in the world – is at no. 15. During the 1960s, the innovative Tommy Nutter was based at no.35 – and his sometime clients The Beatles used no. 3 as the HQ for Apple Corps from 1968 to 1972. During the 2nd World War, Savile Row police station, at No. 27, was used as a weapons store by the Special Operations Executive, the ‘subversion unit’ of the British secret service. R.D. and D.S. Esoteric London is one year old today. We would like to thank our readers for their interest over the past year – David, Roger and Katy. Can anyone tell me what typeface that is?